Town chairman David Bosomworth admits a “sea change” has taken place at the club over the summer. 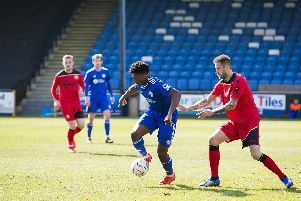 The Shaymen have adopted a full-time model for the first time since reforming a decade ago, and now train around three mornings per week with a squad of full-time professionals. Bosomworth thinks it is the biggest summer the club has had since it reformed. “We’re very positive and excited,” he said. “Every team is at this time of the year. “It’s amazing how quickly it comes round. “We all say ‘this is the biggest’ or ‘this is the most important’ and it’s all relative to the time you’re in, but I would say this is a sea change and it will stretch our resources. “The only way we’re going to cover those resources is if the brand of football encourages people to come through the gate. “If we’re less on season ticket sales let’s hope there are more coming through the gate. When asked how the summer transition from part-time to full-time had gone, Bosomworth said: “Obviously there’s a lot of extra work involved, numerous things really, but first and foremost you have to bring a team in. “From last season there’s only four or five players still with us. So it’s been a sea change in that respect. “There’s also the fact that some of the players coming in are from further afield so you have to look at things like accommodation. “We’re looking at more costs with the training ground. There are costs all the way as we go along. “Those are challenges we have to address and are part and parcel of increasing the season ticket prices was to try and help contribute to those costs. When asked how any potential shortfall in costs would be covered, Bosomworth said: “We’ve always tried to manage the club working as a commercial operation, so we’ll see how the season unfolds and utilise reserves we’ve generated over the last couple of years. The chairman said training at the Weetwood Sports Park in Leeds was now a “long-term commitment”. “We need good grass and a facility that has as professional a feel as it can,” he said. Bosmoworth feels the National League has only got stronger over the summer, adding: “You’ve got two more teams coming down with the parachute payments, and you’ve got two teams who are incredibly wealthily backed in Salford and Harrogate. “I think Salford are favourites to take the title. They’re probably a league club in all but status in playing strength. “Those are challenges. We play them in our fourth game so that will be an early barometer. “Only time will tell how we get on. The manager has been splitting the team a bit in the friendlies and having a look at who has contributed what, and what formation and combinations will work best.